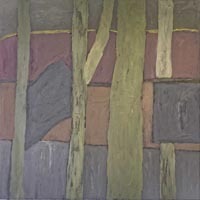 Connecticut artist Lou Hicks opened the exhibition schedule at Miranda Fine Arts' new gallery space, in November 2000, with a solo show called "Places." An oil painter, Ms. Hicks has exhibited around the world, from New York to Arizona, Ireland to Japan. Using subject matter fueled by place,her work is about deep, rich, earth color and texture, inspired by the space, color, and cultural differences found in her travels around the world. Bringing these elements back to her studio, also in the Landmark Lofts building, she incorporates these far away inspirations with the local landscape of Port Chester and Connecticut in her lush abstract paintings.